Scroll naar beneden voor Nederlands recept. Autumn. It’s here. It’s crisp, fresh, clear and chilly. Weather, that just begs for heartwarming dishes. In fall this stunningly beautiful dish is just what the doctor ordered. With its lovely seasonal colours, satisfying bite and nice and hot temperature. Plus it’s perfect for Kapha or earth types because of the use of barley. Many people have no clue what to do with barley. It’s that type of grain that you see at the organic store, wonder about, but leave on the store shelves visit after visit. Well, let me come to Barley’s rescue, cause it is so worth giving it a try. At your organic supermarket you will most likely find regular unhusked barley, which takes a very long time to cook. Sometimes up to two hours. Or my personal preference, pearled barley, which cooks much quicker and becomes very creamy. Thus making it wonderful for risotto. In Ayurveda we especially recommend barley for Kapha types due to its drying quality. Once cooked it’s a heavy grain so you eat less of it and stay full for longer. Ideal when you want to lose some weight, which is often the case for many Kapha types. On this year’s Valentine’s day I already posted a barley risotto recipe for lovers using beautiful red beets. 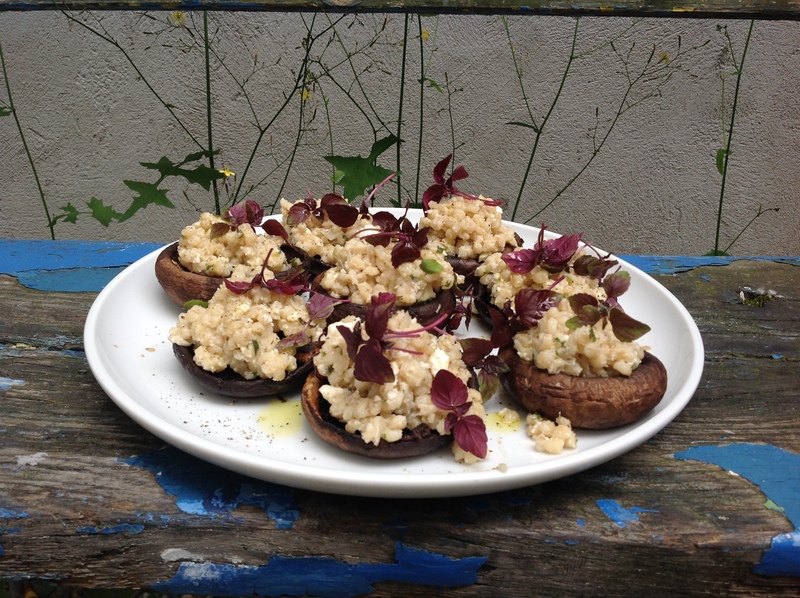 In this version the risotto is plainer, so the portobello mushroom in which it is served can be the shining star of the dish. For an even more Kapha friendly version omit the cheese. I would recommend this dish for a more lavish affair as it does take some preperation time. But I can imagine it being perfect on a Vegetarian Thanksgiving table served with a crisp carrot and poppy seed coleslaw and a citrusy baby spinach and artichoke salad. Preserved lemon is an ingredient often used in Morroccan and other Middle Eastern cuisines. Basically it’s whole lemons that are covered in salt an spices and left for weeks to preserve. Only the skin of the lemon is used once done. It has a very distinct flavour so a little goes a long way. It really is worth the trouble looking for and I easily find it at my Morroccan vegetable market stall or specialty store. But if you can’t find it use some grated organic lemon rind instead. Kapha’s of the world, enjoy! First cook the barley. Heat the sunflower oil in a heavy-based saucepan and sauté the onion and garlic until translucent. Add the stock and bring to a boil. Stir in the barley, lower the heat, then cover and simmer for 1 hour, until all the liquid has been absorbed and the barley is tender. Meanwhile, preheat the oven to 175° C. Take a large baking sheet and grease it with two tablespoons of the ghee. Scatter the thyme sprigs over it. Stem the mushrooms and place the mushroom caps, stem-side up, on top of the thyme. Pour over the stock and scatter the sliced garlic over. Drizzle the remaining ghee over the mushrooms, then season with salt and pepper. 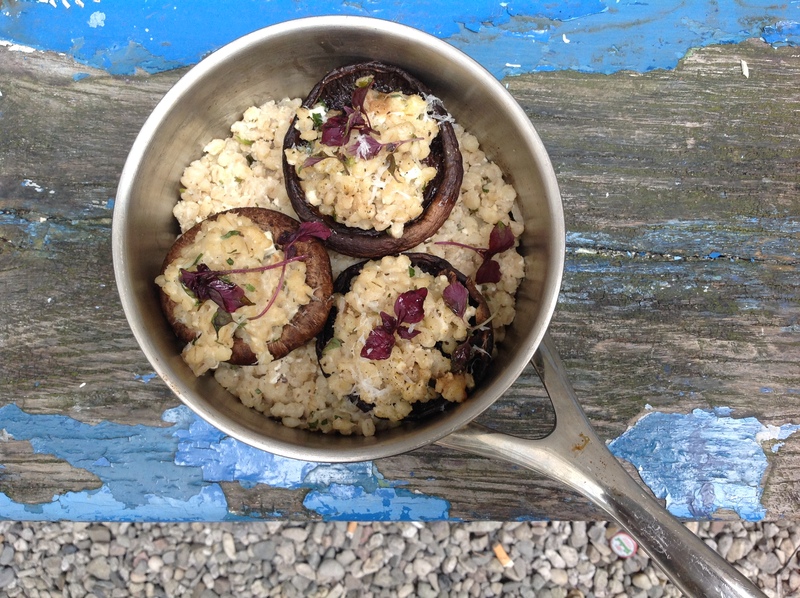 Cover the pan with aluminium foil and place in the oven for 15 to 20 minutes, until the mushrooms are tender. Leave them in their cooking juices until you are ready to serve. When the barley is done, remove the pan from the heat and stir in the preserved lemon, feta (if using), parsley and thyme. Taste and add salt and pepper. 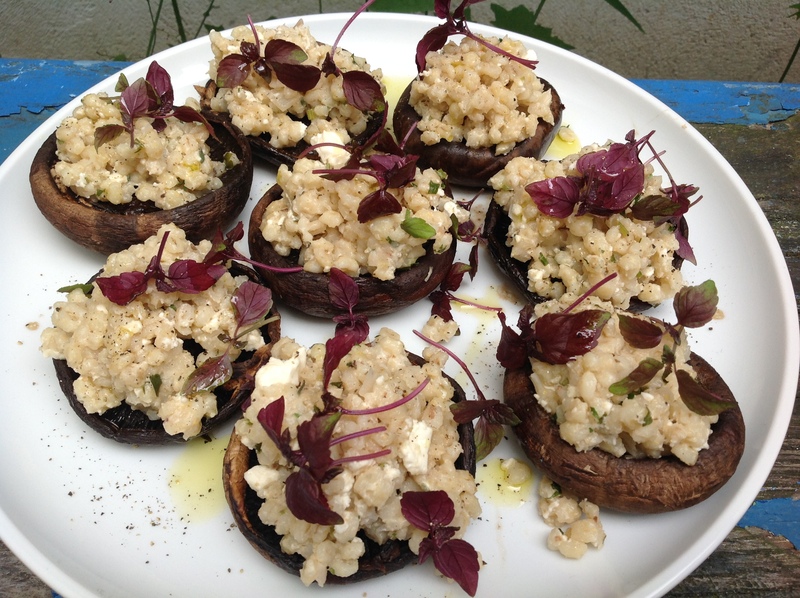 To serve, reheat the mushrooms in the oven for a few minutes, if necessary. 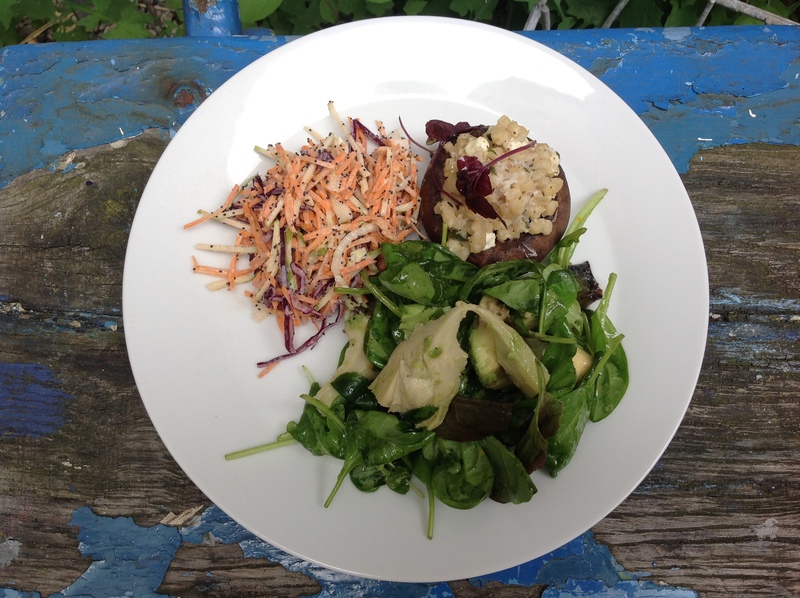 Place each mushroom, stem side up, on a serving plate. 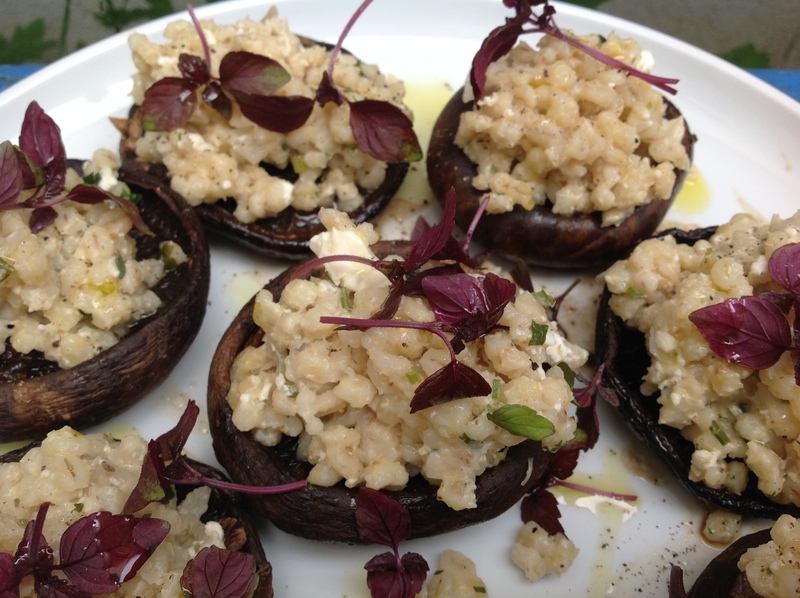 Scoop the barley on top and spoon some the mushroom cooking juices over. Garnish with basil or other sprouts. Bereid eerst de gort. Verhit de zonnebloemolie in een pan met zware bodem en bak hier de ui en knoflook in tot de ui glazig is. Voeg de bouillon toe en breng aan de kook. Roer hier de gort door en verlaag het vuur. Zet een deksel op de pan en sudder 1 uur tot al het vocht is opgenomen en de gort zacht is. Verwarm ondertussen je oven voor op 175° C. Vet een bakplaat in met 2 eetlepels ghee. Bestrooi met de tijmtakjes. Verwijder het steeltje van iedere paddenstoel en zet de paddenstoelen met de hoedjes naar beneden op de bakplaat. Giet de bouillon hierover en verdeel de knoflookplakjes over de paddenstoelen. Bedruppel met de overgebleven ghee en breng op smaak met zout en peper. Bedek met aluminiumfolie en bak 15 tot 20 minuten, tot de paddenstoelen gaar zijn. Laat afgedekt in het kookvocht tot je klaar bent om te serveren. Wanneer de gort klaar is haal je de pan van het vuur en roer je er de gezouten citroen, feta (als je die gebruikt), peterselie en tijmblaadjes door. Breng op smaak met zout en peper. Om te serveren verwarm je, zo nodig, de paddestoelen weer een paar minuten in de oven. Verdeel ze daarna over borden, schep er de gortrisotto in en besprenkel met wat van het paddenstoelenkookvocht. Garneer met basilicumblaadjes of kiemgroenten.